We often need to fully clean a container by deleting all the contents. 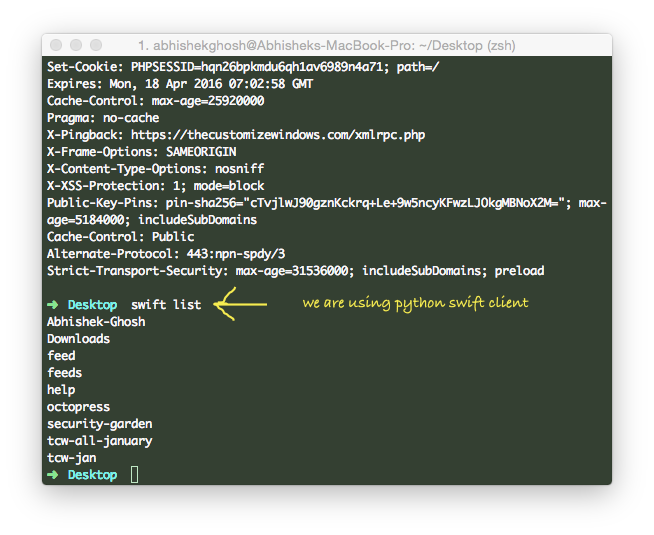 Here is How to Bulk Delete OpenStack Object Storage (Swift) Objects. It is important to properly configure OpenStack Python Client first. We are using HP Cloud as client of their OpenStack Object Storage (SWIFT) service. This eventually deletes all the CDN objects as well. Upon execution of the command, we will get an output. In our example, the container is published as CDN. We were using it to store XML Feeds on non-HTTPS URL for Google Feedburner. It is a fix for Feedburner’s no support for HTTPS. Then if we can create same named container from web GUI within few seconds of deletion, the container specific setting remains intact! It remains intact or not – actually deleting a container is equivalent to deleting all the objects. Same named container can be created. We were also thinking in that complex way possibly you are searching for. Actually we can not use * to delete all. --all or -all flag works a bit oddly. Second way to delete all is using auth token. We have HP Cloud specific OpenStack Object Storage (Swift) token generation guide. Reverse of Bulk Delete is Bulk upload. That we have Python Based She Bang Script to automate the bulk upload work. This Article Has Been Shared 5637 Times! Cite this article as: Abhishek Ghosh, "Bulk Delete OpenStack Object Storage (Swift) Objects," in The Customize Windows, June 23, 2015, April 21, 2019, https://thecustomizewindows.com/2015/06/bulk-delete-openstack-object-storage-swift-objects/.